The instructions for our sample exchange say that samples are supposed to be finished somehow so the ends won't unravel. I just can't bear the thought of getting my sewing machine out and sewing through cassette tape each time I remove some samples. So on the first couple I just knotted the ends. That is pictured on the left. This was a pain in the fingers as well as my patience. Plus, it used up a lot of warp since the ends had to be long enough to make the knots easily. I always find finishing to be a bear...it is so anti-climatic. I much prefer a piece which minimizes off loom finishing...and if you cut it off and it's done - that's simply the best. I decided to try what I do on tapestries for these samples. 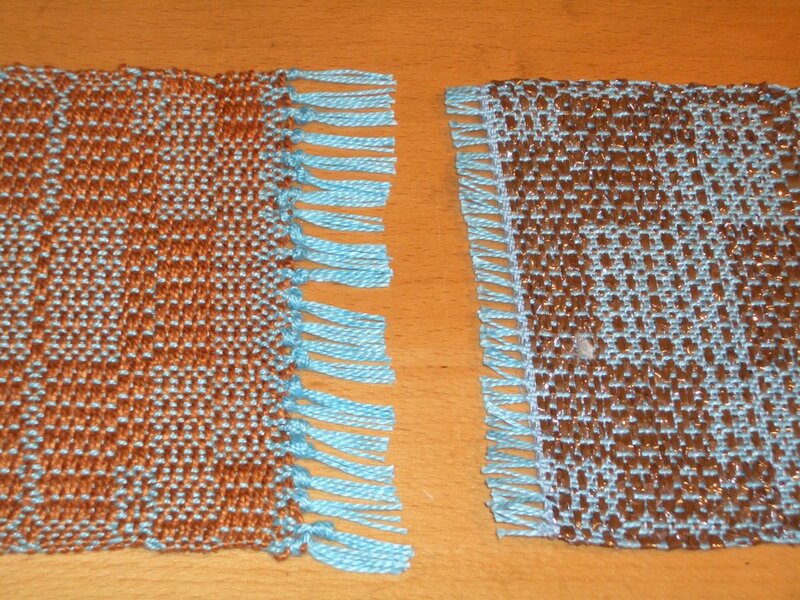 I switched from knotting to tying double half hitches around 4-5 warp threads while on the loom. 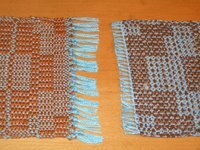 Then when I cut the piece off the loom...it is done. And look how neat and tidy it is! Speaking of finishing...check this out to see the tapestry I just finished and hung. I have been working on the finishing off and on for about three weeks. It's been off the loom for at least six weeks or more!